"Yummy and easy! What more could you want in a recipe?" Dissolve the cornstarch in the chicken broth, and stir in the soy sauce, ginger, and hot sauce; set aside. Heat half of the oil in a wok or large skillet over high heat. Stir in the chicken; cook and stir until the chicken is no longer pink, about 5 minutes. Remove the chicken from the wok, and set aside. Pour the remaining tablespoon of oil into the wok, and stir in the onion, green bell pepper, and water chestnuts. Cook and stir until the chestnuts are hot, and the onion has softened, about 5 minutes more. Stir up the sauce to redistribute the cornstarch, then pour into the wok, and bring to a boil. Add the reserved chicken, and stir until the sauce thickens, and the chicken is hot. 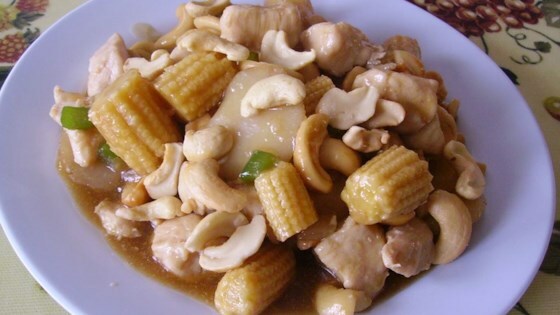 Sprinkle with cashews to serve. For the veggies I used a red bell pepper, onion, and zucchini. This was good but I found the sauce to be a bit bland. Added hoisin sauce. Replaced green peppers with julienned carrots and green beans. Delicious. Very good. I added a little garlic and a dash of sesame oil. Make sure you rinse the water chestnuts before adding to get rid of the 'tinny' taste they sometimes have.